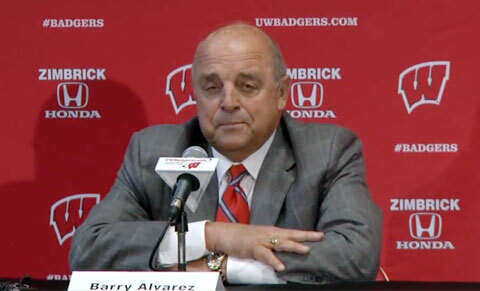 Alvarez is currently in his 10th year as the athletic director at Wisconsin. During his tenure the Badgers have won a combined 14 national championships and 44 conference regular season or tournament titles. While serving as the head football coach at Wisconsin from 1990 to 2005 he guided the Badgers to three Big Ten and Rose Bowl Championships and became the all-time winningest coach in school history with an overall record of 118-74-4. He was inducted into the College Football Hall of Fame in 2010. The following video shows, Barry Alvarez, speaking to the media following the departure of Bret Bielema. He also discusses the search for Wisconsin’s next football coach. A former linebacker at Nebraska, Alvarez has coached nine first-round NFL draft choices and 59 draft choices in all. Before landing at Wisconsin, Alvarez coached the linebackers at Iowa from 1979-86. He was also the linebackers coach for the 1987 season at Notre Dame before taking over the defensive coordinator position for the Fighting Irish from 1988-89. If you would like to book football speakers like Barry Alvarez for a speaking engagement, autograph signing, product endorsement, fundraiser or special event, contact Barry Alvarez’s booking agent for appearance and speaker fees at Sports Speakers 360 or call 1.855.303.5450.